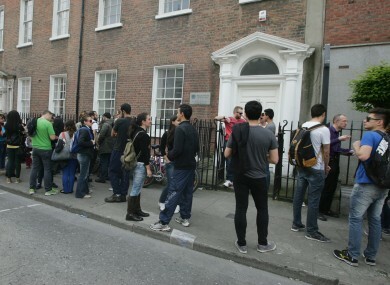 Students from the Millennium College arrive at the college on Dominick Street Dublin, to find that it has closed. INTERNATIONAL STUDENTS AFFECTED by college closures must now be in full-time study to comply with their immigration requirements the Minister for Justice has said today. Minister Frances Fitzgerald says that those who have not yet enrolled in an appropriate education programme must do so immediately. “We are now past the 1 September threshold where the students affected by college closures were regarded as being on academic holiday,” the minister said. I would remind those students that they are resident in Ireland on the basis of being an international student. For future immigration registrations they will have to demonstrate that they have fulfilled the immigration requirements of international students and have been studying full time. Fitzgerald made the comments as the Government announced a clamp down on ‘rogue operators’ in the education sector that have been ‘abusing student immigration’ following the closure of a private colleges. The new rules announced today by the Ministers for Justice and Education will mean that only programmes accredited by Irish awarding bodies will be able to recruit international students. There will be a number of exceptions to this according the the Department of Justice with the rules coming into place from the beginning of next year. It comes as after the closure of seven private colleges in the last five months which have left hundreds of international students without courses and in some cases accommodation. Speaking at the announcement of the reforms, Fitzgerald said that alternative educational accommodation has been put in place for the affected students. Another pledge promises greater inspection of colleges to monitor educational standards and immigration compliance. A third change will alter the rules to standardise the right of international students to work. The Government says this will “clamp down on abuse and to make the situation clearer for students and employers alike”. Education Minister Jan O’Sullivan says that thousands of students come from abroad to study in Ireland and our reputation is at stake. “We cannot let our international reputation be damaged by low-quality provision or rogue operators,” she said. “These reforms are crucial to ensuring that only those providers which can offer the highest standards can attract international students”. Email “Students from closed colleges must be in education for immigration reasons - Minister”. Feedback on “Students from closed colleges must be in education for immigration reasons - Minister”.